You’d never relate concerts and entertainment with leading online shopping platform Lazada, but this may perhaps change your mind. The Lazada app has transcended e-commerce and has now become a platform for everyday needs, entertainment and business purposes. And to celebrate its 7th birthday, it is adding addictive games and bringing a livestreamed concert by Grammy award-winning singer Dua Lipa, as well as over 24 million products with amazing deals within its app. The app is no longer just the app for shopping, but also now a source of fresh, fun experiences—aside from its wallet-busting prowess. Through its Live Work Play approach, the platform also creates opportunities for more than 400 brands, over 70,000 sellers, 500 influencers, as well as major banks, telcos and a strong network of third-party logistics suppliers. There’s plenty to look out during Lazada’s week-long 7th birthday celebration. Following the success of its 11.11 Super Show livestream and broadcast, Lazada will be hosting inaugural “Super Party” music concert that will be livestreamed on its app simultaneously across six markets on 26 March at 8.30PM, local time. The international livestream is a first for the company and it has never done on such a scale. The Super Party will be a star-studded affair, headlined by Grammy and Brits Awards winner, British popstar Dua Lipa. She will be joined by Malaysia’s Anugerah Juara Lagu 2019 winner Hael Husaini and YouTube singing sensation Ismail Izzani. Also in the line-up are Southeast Asia’s rapppers and pop acts Urboy J, Saykoji, THELIONCITYBOY, Angger Dimas, and Dipha Barus. Adding plenty of stickiness to the app are three fun-filled games to play – Fruit Slash, Popping Balloons and Birthday Blast. They’re not just fun, but by collecting cupcakes you’ll be able to trade them for vouchers at the Reward Store. Play and collect them from 21 to 27 March 2019. These can be redeemed on 27 March to enjoy more discounts. Group Buy is an interesting social shopping concept where you can invite friends and family to shop for the same product and receive a “bulk” discount. From 21 to 27 March, look out for products with the Group Buy icon. Select a product and proceed to Checkout. You will then see a “Create Group” button which you can tap to invite others to join in. You have 24 hours to fulfil the number of people. You can check your progress under “My Orders” section. Once the group reaches the required number, you will be charged and your order processed. Imagine snatching a washing machine for MYR77.70 or PS4 with seven friends for MYR777! When you top up your Lazada Wallet from 21 to 27 March with a minimum of MYR30, you will receive MYR30 worth of rebates, with 10 percent rebates for first time wallet top-ups and 5 percent rebates for top ups by existing users. Shopping with the Lazada Wallet will also give you 5 percent cashback for Fashion and Health & Beauty products, and 1 percent for all other categories. On 25 March at 7PM, be among the first 177 new wallet users to make an initial top up of at least MYR77 and get an extra MY77 instant rebate. Flash sales are uber popular and it’s not hard to see why. 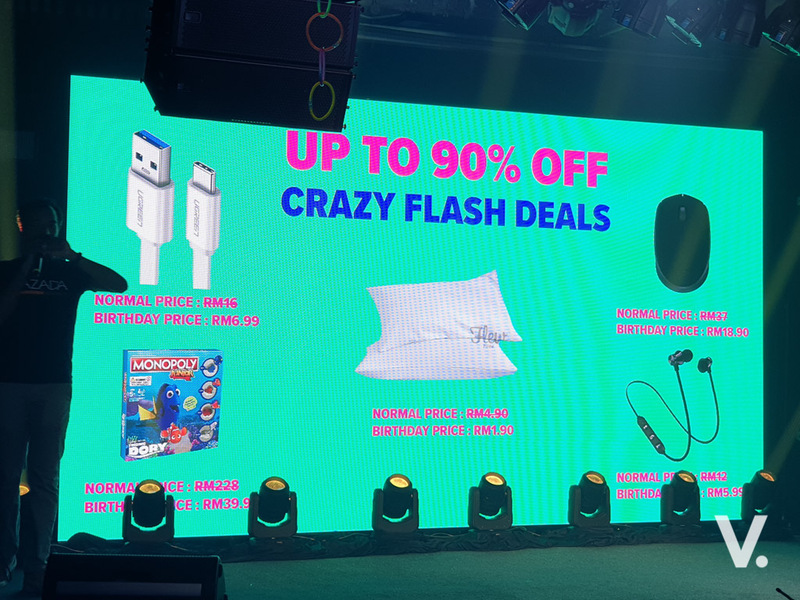 Look out for MYR0.15 crazy flash deals happening nine times on 27 March at 2AM, 8AM, 10AM, 12PM, 2PM, 4PM, 6PM, 8PM, and 10PM. To ensure you don’t miss these sales, hit the “Remind Me” button on the products so you’ll receive a push notification when sales start. For just two hours on 27 March, enjoy discounts of up to 80 percent off Habib jewellery when you shop Lazmall from 12AM to 2AM. Or win exciting gifts from brands like Estee Lauder and Tefal. Pick up featured products for as low as MYR1. Enjoy deep discounts on products such as the ASUS ZenFone 3 Zoom, Huawei Honor 5c, electric guitar set and more. Simply tap on the “Slash It” button next to your desired button and initiate a slashing session. Then tap “Invite Your Friends to Slash,” and “Get It” when the number of required slashes is achieved. From 21 to 27 March, you can start adding to your shopping cart various products under MYR27 with Free Shipping under “Hot Themes.” This is accessible via the Lazada Birthday Main Campaign page. And on 27 March, you can tap on “Checkout” to purchase the products with zero shipping fee (for West Malaysian customers only). The offer covers hot products from categories such as Mother & Baby and Furniture and Décor. Several partner brands are offering discounts and cashbacks including Hong Leong Bank, Domino’s Pizza and Mastercard. Enjoy discounts when you purchase using Hong Leong Credit or Debit Cards. For MYR77.70, you can get seven items from Domino’s and a free cake. Also, choose from any of the seven offers from Domino’s e.g. Regular Pizza a just MYR7.70. Save your Mastercard (credit, debit, prepaid) for your purchases on Lazada and get 17 percent cashback in your Lazada Wallet*. The first seven Mastercard card holders every hour using their Mastercard to shop on Lazada will receive MYR70 cashback in their Lazada Wallet. *For first time adds only. To accommodate the expected increase in sales, Lazada’s eight warehouses will operate on a 24-hour schedule over the four days starting on 27 March. Lazada expects to pack more than 150 items per minute. For shoppers who prefer to pick up their packages instead of delivery, Lazada is adding Collection Points as a new delivery option. You can choose from a preferred station to pick up your order – at a time and location of your choice. The service is available in the Klang Valley; Lazada plans to expand this nationwide. I know it’s a lot to take in, but you’ve got the week to play around with the Lazada app, so take it a step at a time. Remember to add products you want into the Shopping Cart first, especially those tagged with the “BDAY” tag, and look out for crazy flash deals. Did you know you can Grab incredible MYR1 car rides?